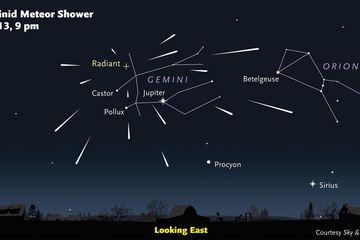 The Geminid meteor shower should be at its peak tonight, from 9 or 10 p.m. until dawn Saturday morning. The best viewing time is after your local moonset: in the hour before the beginning of morning twilight on the 14th. But bright meteors will show even through the moonlight earlier. This entry was posted in sky watching and tagged Geminid Meteor Shower on December 10, 2013 by Stewart Dale Spencer.